Just back after a 3 day visit to my mom's place. Feeling very tired but still wanted to share this great recipe with you all. This is a 4-in-1 batter recipe. You can make appam on the first day, dosa on the second day and paniyaram (both sweet and savory version) on the third and fourth day. Sounds great isn't it? I have named it hotel dosa as the dosa texture is very much similar to what you get in hotels but should be served hot. Today we will learn how to prepare appam, hotel dosa batter recipe and a quick sambar for idli and dosa following our easy recipes. Wash and soak both rice together for 5-6 hours. Wash and soak dal and fenugreek seeds together for 4-5 hours. Grind urad dal + fenugreek seeds until light and fluffy. I used the wet grinder for grinding the dal. Check out my post in detail on how to grind for idli and dosa. It took 20 minutes for me to grind urad dal. Do not add water at a time. Add little water 3-4 times in between grinding. Remove it and keep it aside. Grind both rice together until smooth adding water from time to time. Remove it and add it to the urad dal batter. Using your hands, mix both rice and dal batter together adding salt needed. Leave it to ferment over night or for 6-7 hours. It will take a longer time if the weather is cold and lesser time if the weather is hot. Mix well and take batter needed for appam in a separate container. Add little water to it, mix well and make appams. Check out my detailed post on how to make appam. Make dosa on the second day (you can even make it on the first day) and sweet paniyarams or kuzhi paniyarams on the third day. Check out how to make dosas at home. 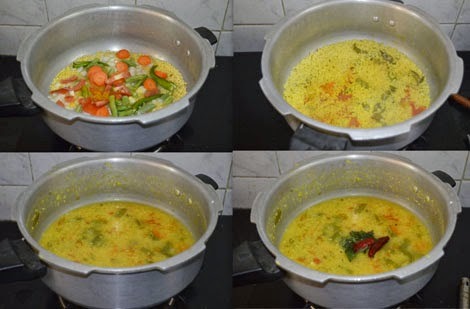 In a cooker/pressure pan, add dal, onion, green chillies, carrot, beans, salt, turmeric powder, 1 cup of water and pressure cook for 3-4 whistles. Once the pressure subsides, open the cooker, mash the dal well, add more water, tamarind water/paste and boil for 2-3 minutes. Heat a tsp of oil, add mustard seeds, when it splutters, add curry leaves, red chillies and pour it over the sambar. Serve hot with idli or dosa.The consistency of the sambar should be watery. 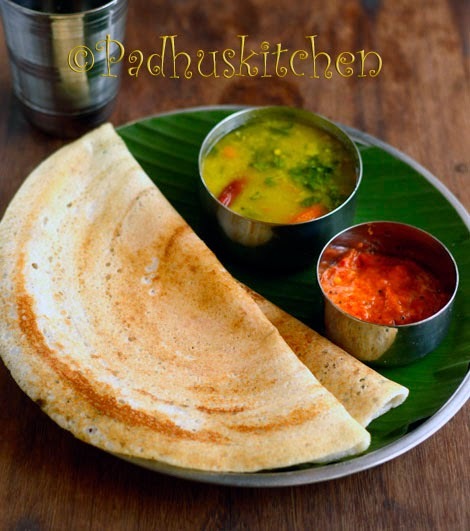 Check out my 100 Breakfast Varieties for more than 20 varieties of dosa, adai, pesarattu etc. This is definitely a keeper. Nice post padma. Am hungry again after seeing ur post, beautiful platter. Two types of par boiled rice are available: idli puzhungal arisi which is oval like wheat and the normal puzhungal arisi similar to the raw rice used for cooking (it also has thick and thin varieties). Which would you advise as more appropriate for a combined idli + dosa batter. Please share your expertise. hi padhu i just have become a great fan of ur recipes. i love ur description style. tried most of ur recipes and have got kudos for the same. thank u friend.